Endless sunshine. beautiful, sugar-white sand. brilliant blue ocean. 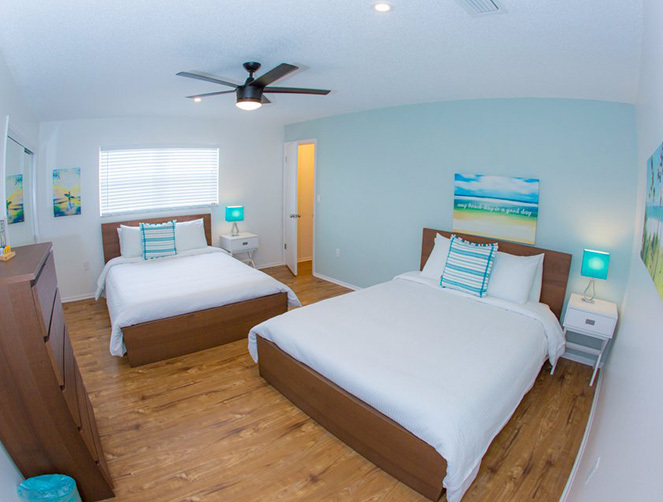 St. Pete Beach Suites is perfectly seated just a three-minute walk away from a warm, soft-sand beach on the Gulf of Mexico. 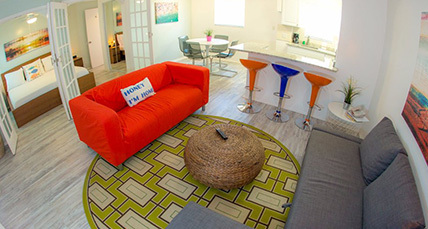 We are also close to some of the best bars, tastiest restaurants, and trendiest shops in Florida. 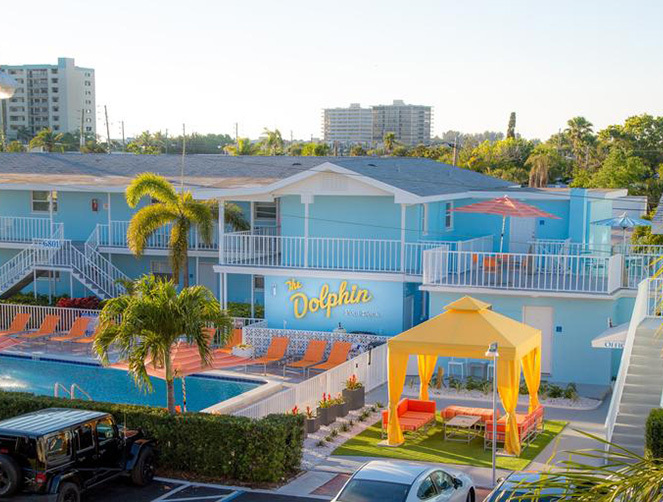 Our family-owned boutique hotel has been welcoming guests since 1948, back when it was known as the Dolphin Hotel. 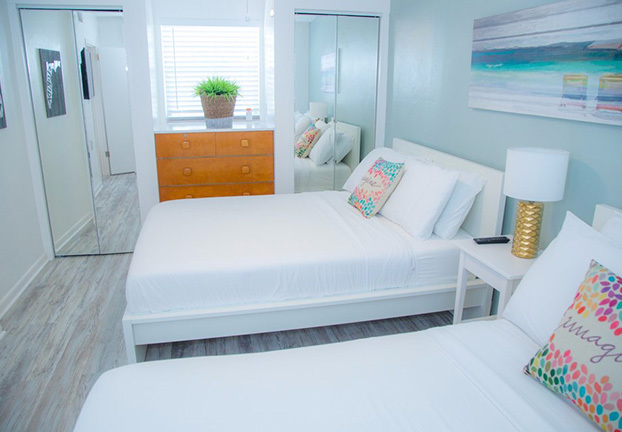 Between 2016 and 2017, St. Pete Beach Suites underwent a complete remodel with careful attention paid to preserving many of its most iconic, retro features. The large dolphin pool fountain, vintage woodwork, and playful interior accents all pay homage to a time past but not forgotten, reminding guests every moment of the hotel’s uniquely Floridian history. We look forward to hosting you, and we hope that our slice of paradise will become your new favorite place to relax. 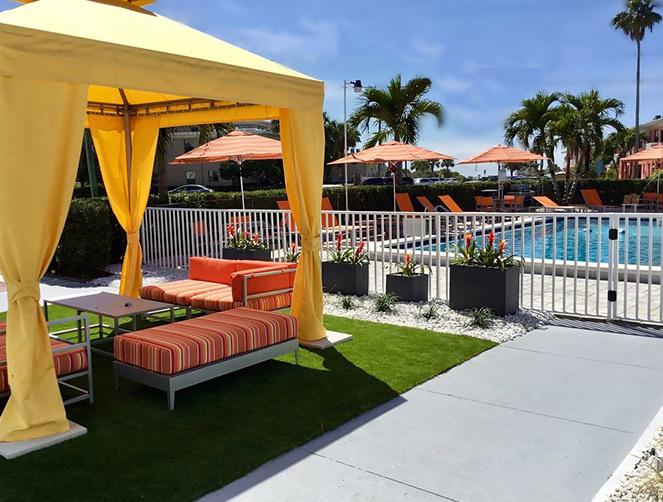 At St. Pete Beach Suites, guests can enjoy our poolside cabanas, lounge chairs, and old-school pool towels that enhance sunny days spent swimming or lounging at our two on-site pools: one heated, one unheated. Guests can barbecue on two gas grills that are located in our beautifully landscaped courtyard and picnic area. Additional conveniences include an ice machine, vending machines, and on-site laundry. Our front desk is open between 9 AM and 6 PM daily. Our friendly team of managers are always on hand to assist with whatever our guests may need during those times. For after-hours check-ins, we provide lockbox room access so that you will have no trouble getting into your suite. 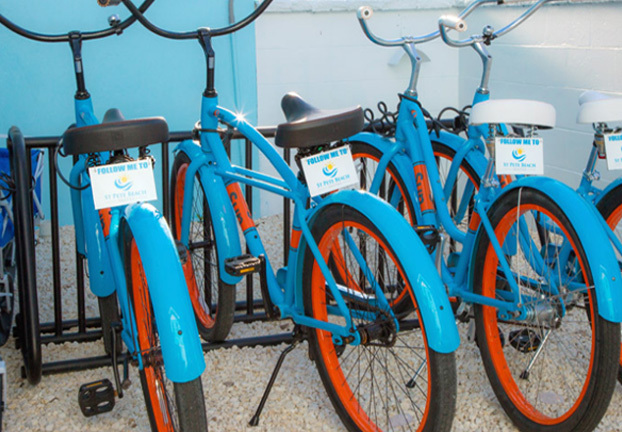 We offer complimentary WiFi; complimentary self-parking; and complimentary bicycles, beach chairs, shade umbrellas & beach towels. Our guests also enjoy a complimentary continental breakfast on Saturdays and Sundays, and our complimentary happy hour every Friday is a great opportunity to get to know the managers and the other guests. St. Petersburg, Florida boasts an impressive world record for the most consecutive days of sunshine in a row: 768 days. 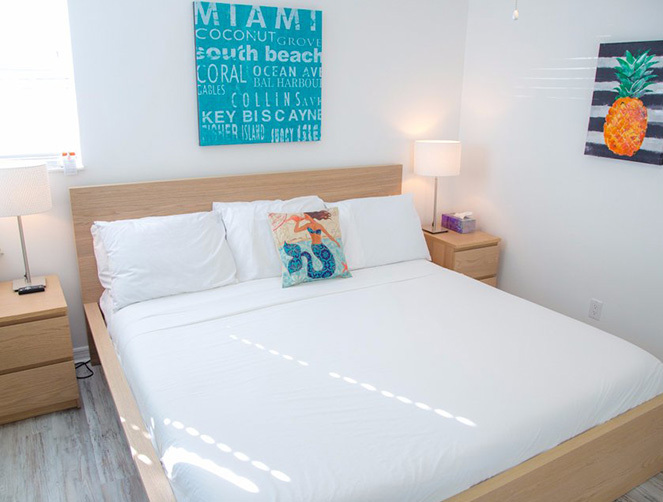 Guests of St. Pete Beach Suites enjoy easy access to fantastic restaurants, breathtaking sunsets, and Gulf waters that are warm enough to swim all year. Activities like parasailing, jet skiing, kite surfing, world-class fishing, and dolphin watching are all available nearby. 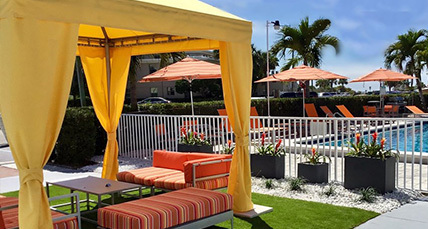 Whether you want to dance the night away, enjoy an exceptional meal, explore art and music, or just relax by one of our two on-site pools, there is always something exciting to do in St. Pete Beach! Our hotel has 37 one-bedroom and studio suites, and a separate 3 bedroom beach house, and 3 bedroom Villa . 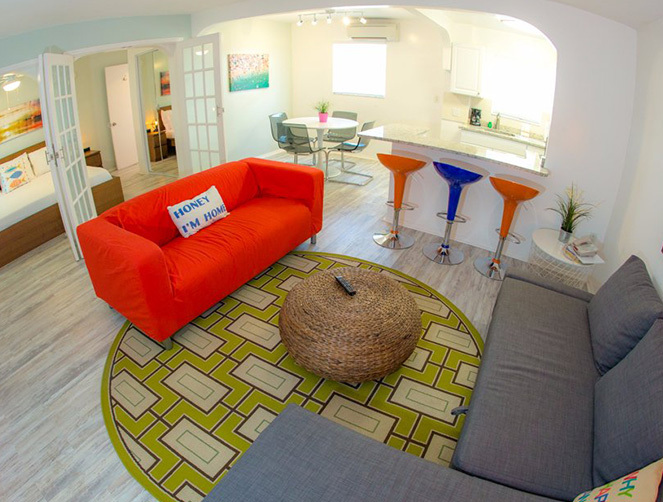 There are a variety of floor plans to suit any type of vacation, amount of people, and length of stay. Our hotel has stood for decades in the quaint holiday town of St. Pete Beach, Florida. Our local beach has been rated by Trip Advisor as the 1st (2012) 2nd (2015) and 3rd (2017) best beach in the United States. Known as “the sunset capital of Florida,” St. Pete Beach has a phenomenal world record for the most consecutive days of sunshine in a row – 768 days.